Socrates (c.469-399 BC) was an ancient Greek philosopher from Athens. He is generally acknowledged as one of the pioneers of Western philosophy. Little is known directly of his life, with most surviving information coming via the works of later writers, in particular Xenophon and Plato, who both studied under him. 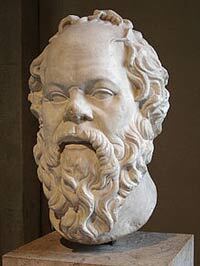 Socrates was born in Athens, the son of a soldier and stonemason. His mother was a midwife, and this lower-class background implies that he would have been given only a basic education, or instead expected to follow his father into craftsmanship. Many historians believe that he worked as a mason for some time before shifting his attention to philosophy. He married a younger woman named Xanthippe, and the couple had three children. Little is known about his family life, although Xanthippe was rumored to have been unhappy with Socrates’ philosophical career as it would not bring in sufficient money. As was required by the law of Athens, Socrates performed military service, acting as an infantry soldier and fighting in the Peloponnesian War. He won fame by saving the life of a renowned general, Alcibiades. His reputation for fearlessness remained with him for his whole life. Plato wrote that he was rather stocky and short with eyes that bulged out of his head. Despite falling short of the classical Athenian ideals of the male form, Socrates was more interested in the performance of the mind rather than the body, a position which his students generally shared after hearing his superb debating skills. According to Socrates, philosophy was only worthwhile if it could practically improve society by means of ethics centered on reasoning rather than theology. He believed that knowing oneself was the prime prerequisite for wisdom, and that increased knowledge allowed a greater reasoning ability. This, Socrates felt, was especially true in the political arena. He was unimpressed with both outright tyranny and outright democracy, instead favoring rule by men with a combination of knowledge, ability, and virtue. They should also have a full understanding of their own natures. As such, he believed that the city itself should act as a classroom. Following this doctrine himself, Socrates asked many questions of both ordinary Athenians and members of the city’s elite. By this method he hoped to reach truth. Nevertheless, he declined to lecture on his beliefs, instead saying that his own lack of ideas made him ignorant, although the very knowledge of this ignorance made him wise. By the dialectic technique which came to be known as the Socratic Method, he asked questions that forced his audience to use reason to reach a conclusion which was logically coherent. Athens during Socrates’ time was declining sharply in influence, thanks to its crushing defeat in the Peloponnesian War. The resulting doubt and instability caused many Athenians to become angry with the philosopher’s positions, claiming that he was threatening their way of life. He was eventually tried and, despite a spirited defense, convicted by a clear margin of the jury. He was sentenced to death, a sentence which was to be carried out by making him take a drink containing hemlock. Socrates refused offers from friends to bribe the guards, instead stating that he would die by the laws of Athens. His death was described in a dialog by Plato.